The parents of my wife’s 2nd great-grandfather, Samuel Aquilla Long, are unknown. Some researchers indicate that his father’s name is John, however, I can find no source for that suggestion. FamilySearch and Ancestry have no other suggestions nor hints about his family. Previously, I looked at the Longs of Martin County in the 1850 Census. In this posting, I continue my research for Samuel and his parents in the 1840 Census. Samuel was born about 1817 in Martin County, North Carolina. He married Martha Ann Bryan in 1844. Because that, I suspect he was enumerated in the 1840 Census as a single 23-year-old living with his parent or parents. The 1840 Census does not provide the names of individuals in a household; it only provides the name of the head of the household. 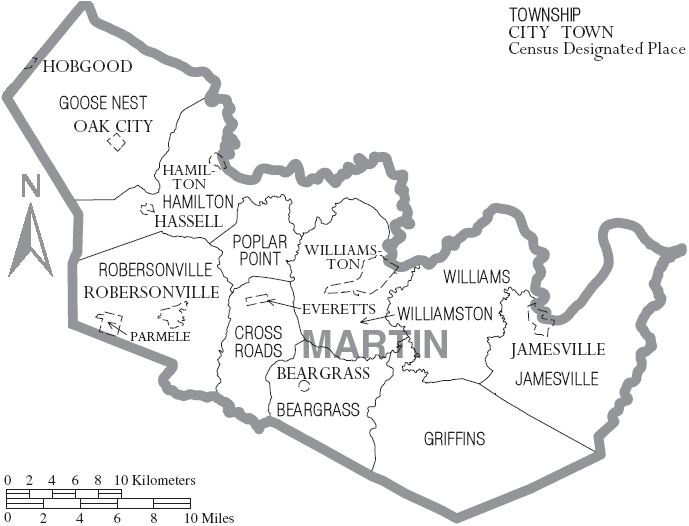 The 1840 Census provides the names of four heads of households in Martin County, North Carolina; Joshua Long, Stephen Long, Gracey Long, and W. B. Long. Could any of these households include Samuel? The Joshua Long 1840 Census household is clearly the same household as existed in 1850. All of the children in the 1850 Census are apparent in the 1840 Census. William appears to be a male born between 1825 and 1830. John also appears to be enumerated as a male born between 1820 to 1825. There is another male, unknown born between 1820 and 1825 who was not with the family during the 1850 Census. Samuel would have been 23 during the 1840 Census, so it is unlikely for him to be that unknown individual. The Stephen Long Household includes 8 people, six males. Stephen is obviously one of the males, leaving five unknown males. One of them is in the 20 to 30-year-old range; Samuel would have been 23-years-old in 1840 so this is a possible match. The ages don’t appear to be quite right for the Stephen Long household to be a traditional family. Rather, I suspect that there may be a sibling and/or a sibling’s spouse living with the household. The Gracey Long household consists of Gracey and two young females. Samuel could not have been a member of that family. The W. B. Long household only consists of the 20 to 30-year-old William[v]. Additionally, he lives next to Gracey and looks like he might be an adult child of Gracey’s. If Samuel Aquilla Long was born in 1816-1817 and if he was enumerated in Martin County during the 1840 Census, then the only entry that fits him is to be in the household of Stephen Long in 1840. As such, I will tentatively identify his father as Stephen Long. 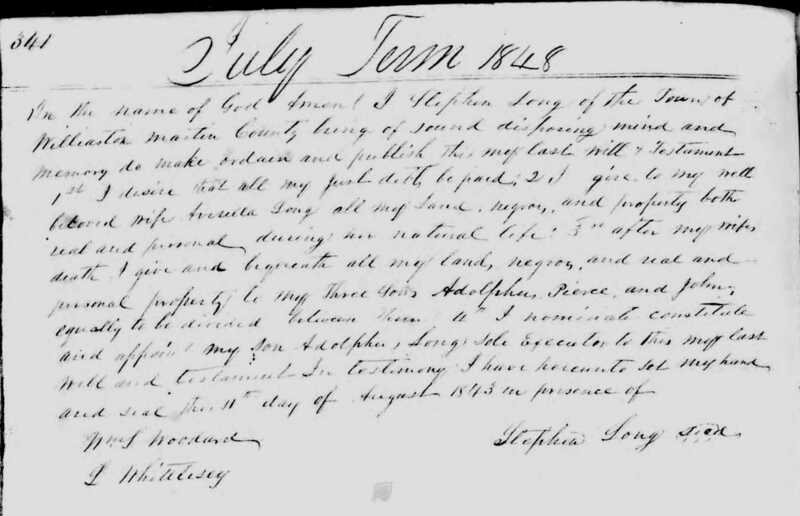 Next, I’ll see what other records I can find in the 1840-1850 time period relating to the Longs of Martin County and see how they connect this family. [i] “United States Census, 1840,” database with images, FamilySearch (https://familysearch.org/ark:/61903/1:1:XHYZ-B6C – 16 August 2017), Joshua Long, District 1, Martin, North Carolina, United States; citing p. 350, NARA microfilm publication M704, (Washington D.C.: National Archives and Records Administration, n.d.), roll 365; FHL microfilm 18,095. [ii] “United States Census, 1840,” database with images, FamilySearch (https://familysearch.org/ark:/61903/1:1:XHYZ-BJD – 16 August 2017), Stephen Long, Williamston Township, Martin, North Carolina, United States; citing p. 362, NARA microfilm publication M704, (Washington D.C.: National Archives and Records Administration, n.d.), roll 365; FHL microfilm 18,095. [iii] “United States Census, 1840,” database with images, FamilySearch (https://familysearch.org/ark:/61903/1:1:XHYZ-BJD – 16 August 2017), Stephen Long, Williamston Township, Martin, North Carolina, United States; citing p. 362, NARA microfilm publication M704, (Washington D.C.: National Archives and Records Administration, n.d.), roll 365; FHL microfilm 18,095. [v] Although the indexer indicated the name of this individual was W. B. Long, my interpretation of the entry is that the “W” has a superscripted “m” following it, suggesting his name as William B. Long. As so often occurs, I get behind. Last summer I received an email from Carrie MC about the Hamilton Primitive Baptist Church. She had fresh information about the church’s status and some photos of the building that I haven’t had a chance to review, catalog, and incorporate into my genealogical files until now. I had mentioned the church in my biographical sketch of Annie Deborah Long Hobbs, which she read. Then she contacted me as a person interested in Hamilton history and the Long family. My wife’s great-grandmother Annie Long was probably a church member when the church was built about 1888 and Annie remained friends with the people there even after she and her husband, James Ashley Hobbs, moved 13 miles away to Williamston. In 2004, Isabel Bernfeld of Hamilton purchased the church with the hope to restore the building. [ii] She apparently did some work. After her death, the building was purchased in 2016 by Carrie MC. Carrie hopes to return the church to its original location and hopes to restore the building. She and I have been in contact and she has let me know about some of the work that has been done including major tree trimming to reduce the risk of tree damage. She also sent a few photos of the church. [iii] The original louvered tower has been replaced with a tower with two louvered panels on each side instead of the original three louvers panels on each side. It is so nice to see historic buildings restored. These old buildings are often places that had significant importance to our ancestors. They are just so precious to our history. Finally, I’d like to mention, there is an interesting blog, “Generations Ago Blog” written by Dan Leigh, who is a 3rd cousin to Mary-Alice (Grandson of Edgar Miller Long). His article, “A Doctor in the Family”, is a beautiful description of his family line and what he learned at the Martin County Historical Society and about country doctors during the early 20th century. [i] Boykin, Jacqueline R. 2006. Martin County’s historic churches: National Register and National Historic District churches. Williamston, N.C.: Martin County Historical Society. [iii] Email correspondence between Carrie MC and Don Taylor 30 July 2018. [Don’s files – Hamilton Primitive Baptist Church.